The entrenched power of the fossil-fuel industry and its political backers isn’t all that stands in the way of taxes on carbon pollution. Outmoded ideas and enduring myths about energy use and taxes are also factors. This page describes and dissects some of these misconceptions. Please send us your own favorite fallacies about carbon taxes. Ditto your suggestions or criticisms of ours. Myth #1. A tax on carbon pollution will harm the poor and middle class. Who says? Some low-income advocates, some left-of-center activists, some conservatives masking as populists. Rebuttal: The wealthy use more carbon-based energy than the rest of us, by far. For every gallon of gasoline used by the poorest quintile (20%) of households, the richest quintile uses three. A similar pattern holds for the other sources of carbon pollution: electricity, jet fuel, even diesel fuel that powers the trucks that deliver goods. It’s true that consumption taxes, a category including carbon taxes, are “regressive” — they take a larger share of income from low-income households — but that’s true only when the use of the tax revenues is ignored. The net impact can be made “progressive,” i.e., beneficial to people of below-average means, by proper distribution of those revenues. One policy option is to distribute the revenue directly to households as regular “dividends.” Climate scientist Jim Hansen and the Citizens Climate Lobby are among those calling for all carbon tax revenues to be returned to citizens in equal, monthly “green checks.” In 2016 CCL released a working paper analyzing the short-term financial impact of a $15/ton carbon fee under this plan. The report, which estimated household carbon footprints with new levels of detail, including crucial geographical variation, found that 53% of U.S. households (58% of individuals) would reap a positive net financial benefit, i.e., receiving more via the dividends than they would pay directly and indirectly in higher fossil fuel prices. The benefits would be greatest for lower-income, younger, senior, and minority households with nearly 90% of households below the poverty line benefitting from a carbon tax. 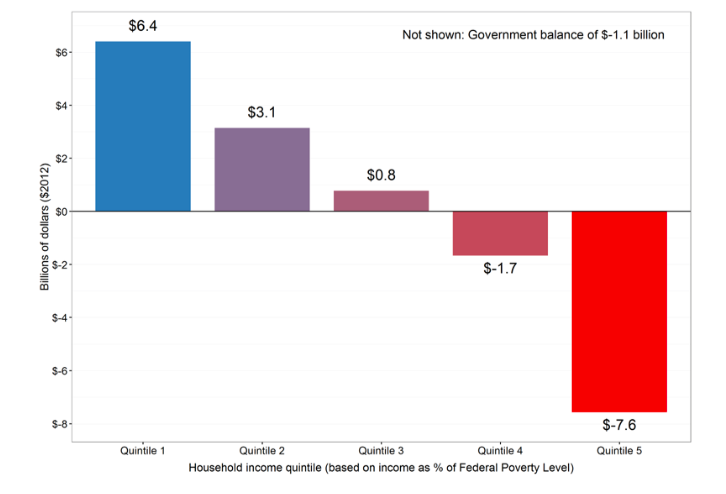 The distributional effect would essentially shift purchasing power from the top quintile of households to the bottom two quintiles, highlighting the income-progressive nature of a fee-and-dividend plan. A worthy alternative, which Al Gore and many economists advocate, is “tax-shifting” — use carbon tax revenues to reduce regressive taxes such as sales taxes and payroll taxes. (See our Issues page, Managing Impacts.) British Columbia has enacted and annually increased its revenue-neutral carbon tax with popular support by dedicating all revenue to reducing a variety of other taxes ranging from sales taxes to business taxes. What’s really regressive is the impact of global warming. Sea level rise, food shortages and storms like Katrina, Irene and Sandy hit the poorest hardest. Myth #2. Carbon taxes won’t change habits — after all, high gasoline prices haven’t cut usage. Myth #3. Taxes on carbon emissions aren’t necessary. Vehicle efficiency standards and mandates or subsidies for wind turbines, ethanol, hydrogen, nuclear power [pick one or more] will solve the problem. Who says? Special interests, many environmental groups, security advocates, technology buffs. Rebuttal: Standards and subsidies are blunt instruments — vehicle efficiency standards don’t reduce vehicle usage, for example — and are often contested for years and then undermined by “gaming” (viz., the “light trucks” exemption from CAFE standards, or tax credits for hybrid SUV’s). Moreover, fuel usage is ever-changing and diffuse (a majority of petroleum is not used in cars or light trucks, for example), while efficiency standards are by nature both usage-specific and frozen in time. As for supply, economic theory predicts, and experience confirms, that raising the price of a harmful activity is always more effective at reducing that activity than is lowering prices of the thousands of imaginable alternatives — as we documented in the comments we submitted in January 2014 to the Senate Finance Committee. Only taxes on carbon pollution from fossil fuels can create the clear, rapid, across-the-board incentives needed to propel a massive shift to clean alternatives. Myth #4. Heavy fuel taxes will constrict the economy. Rebuttal: Price volatility wreaks far more economic havoc than high or even steadily rising energy prices. Even fairly steep increases can be manageable so long as they’re regular and predictable, particularly now that the share of economic activity occupied by the fossil fuels sector is at an historic low — provided the revenues are distributed or tax-shifted back to Americans. And carbon taxes need not be draconian to accomplish their mission. Our program of recurring annual increases of $10-15 per ton of emitted carbon dioxide equates to 5-10% increases in energy prices per annum (with the percentages shrinking as the “base” rises and as non-fossil energy assumes a larger share). By comparison, the average annual real increase in U.S. gasoline prices in 2003-07 was 11%, but that didn’t stop the economy from growing at 3% a year. Needless to say, the true long-term threat to the economy (and everything else) is unchecked global warming, as the National Academy of Sciences warned years ago and the National Climate Assessment reiterated more urgently in 2014. Myth #5. Carbon taxes will provide more revenue for government to squander. Who says? Anti-tax groups, some conservatives, Tea-Partiers. Rebuttal: Not if the tax is made revenue-neutral” via dividends and/or tax-shifting (see rebutgtal to Myth #1). Because higher taxes on fuels will create a strong “market pull” to clean energy, carbon taxes will put a big dent in fossil fuel use and CO2 emissions without having to earmark revenues for hybrid cars, mass transit, biofuels, etc. — or to lawmakers’ pet projects. Myth #6. Heavy fuel taxes will price U.S. goods out of the marketplace. Who says? Some business groups, some labor unions. Rebuttal: This argument assumes a static economy, sans adaptation and innovation. In reality, increased energy taxes will shrink the trade deficit (by cutting both volumes and pre-tax prices of imported oil). The higher prices will also spark innovation in clean, efficient technologies better suited for world markets than, say, supersized automobiles. Finally, taxing energy will create parity with our traditional competitors — the EU and Japan — while encouraging like-minded actions in India, China and other emerging economies. In the interim, border tax adjustments can equalize prices of imports from non-carbon-taxing nations. Myth #7. A carbon cap-and-trade system is as good as a carbon tax, and more politically feasible. Who says (or said)? Too many “Big Green” groups; elected officials seeking to “hide the price” signals; business organizations and corporations that know a complex program like cap-and-trade can be more easily gamed in their favor. Rebuttal: Click here for CTC’s dissection of the logistical and strategic differences between carbon taxes and cap-and-trade (they’re not minor). As for political feasibility, the political process has borne out our belief that carbon cap-and-trade was too complex, regressive, cumbersome and undemocratic to succeed. Supporters of cap-and-trade were never able to resolve this contradiction: either it wouldn’t raise fossil fuel prices, in which case it would be ineffectual; or it would raise them after all, provoking an unstoppable backlash among a citizenry that hadn’t signed off on the higher prices and wouldn’t be getting the dividends from the tax revenues, while carbon-market participants skimmed big profits. Moreover, cap-and-trade’s complexity guaranteed that it couldn’t be implemented for several years — the Northeast states’ electricity cap-and-trade system took five years to institute — whereas a carbon tax can be implemented within months, as British Columbia demonstrated with its 2008 carbon tax startup. Myth #8. Americans are too myopic, and our politics too broken, for even revenue-neutral carbon taxation to ever take root here. Who says: Veterans of failed past efforts to take on entitlements; assorted skeptics and cynics — including, sometimes, ourselves. Rebuttal: This is the myth even we at CTC can’t dismiss out of hand. Witness the failure of past fuel-tax efforts, the resistance to fossil-fuel-displacing wind farms in some areas, and the persistence of costly tax entitlements like the deductibility of home mortgage interest payments from federal taxes — each, in its own way, testament to the dictum that “losers cry louder than winners sing,” in the words of University of Michigan tax policy expert Joel Slemrod. Nevertheless, we’re working for a different outcome for carbon taxes. For one thing, emphasizing revenue-neutral carbon taxing can help dispel the presumption that a carbon tax is a tax hike. Second, because the non-climate benefits of carbon taxes are enormous, from cleaner air to less road gridlock, there are many opportunities to broaden support from traditional environmentalists. Finally, unlike 1980 or 1993, when fuel-tax proposals that were primarily designed for budget-balancing went down to defeat, the stakes are frighteningly high. Stiff carbon taxes can’t rescue the climate by themselves, but without them a rescue is virtually inconceivable. We remain hopeful that the American people will rise to the challenge. The Case for a Carbon Tax (by Prof. Shi-Ling Hsu), reviewed here. Chapter 4 offers forceful responses to standard (and largely mythological) arguments against carbon taxes and chapter 5 delves into some of the psychology that biases many people against using price instruments to address global warming.